Shutting down after a busy day. I took my Mom to get her hair cut and permed, she's getting ready for 85th birthday on Nov. 24th. She's not quite as spry as she used to be, but she still motors into my card room with her walker and gives me her wonderful opinions. She's the woman behind all our greatness. 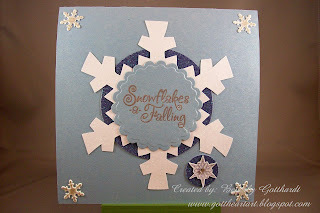 Supplies: Card Blank 6" X 6" with Best Occasions Pearlescent paper, Papers: DCWV Christmas Glitter mat stack, textured white card stock, Stamps: Stampabilities The Paper Studio: Snowflakes, Ink: VersaMark Ink pad, Stampin Up: Not Quite Navy, CTMH: silver embossing powder, Lg. Snowflake free hand w/white glitter paper, Spellbinders Nestabilities Standard Circles Lg. 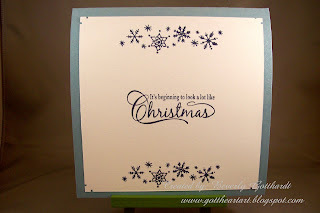 and Classic Scallop Circle Lg., Stampin Up: 1" circle punch, Marvy Uchida: corner punch, rhinestone sticker, snowflake brads. Great card and if anybody can come up with a card that would suit for multiples (if you send a lot of Christams cards), it would be you! Bet lots of folks can adapt this one LOL! A gorgeous card. Thanks for joining us at CCC.